Hi everyone! 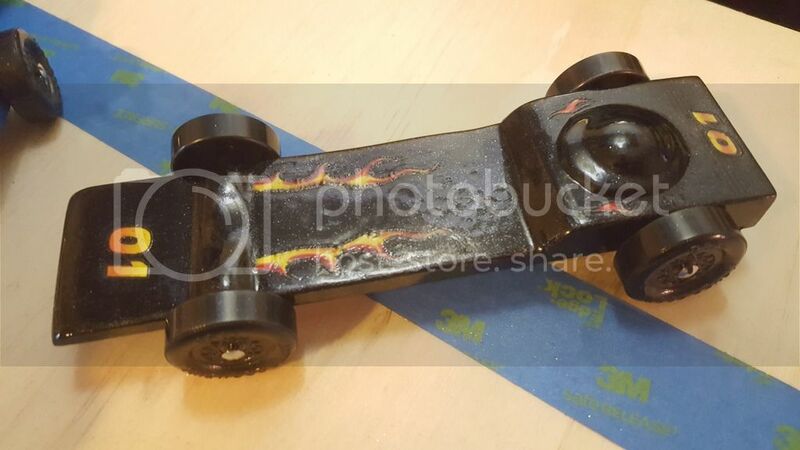 I'm brand new here on DT and to pinewood derby, but thought I'd share my experience and ask a few questions to the experts! I was never a scout but heard great things about it growing up. My son is now a Tiger scout so this was his first experience too! When pinewood derby came around I spent about a month researching, watching videos on how to make things faster and had my son watch a few as well. Our race day got delayed due to building reservations issues, so our pack race day just happened to be on the same day as the district. So no district race for our pack this year. My son designed the car shape he wanted (like an Indy car) and I did the cutting since we were really pressed for time and he might still be a little young to put on the band saw. Took off work on a Monday and Wednesday while kids were home for the holiday and then school canceled for an ice storm 2 days. The practice was that Friday and race Saturday. So basically made both these cars from scratch in less than 4 days. So cut everything out, then applied wood filler to my mistakes and showed my son how to sand and sand and sand. I wasn't sure how the car would turn out but my son did the Indy car design and I did the flat car for speed and in case his didn't work out right. I set up a MyBuddy heater in the garage to bring it up to 50F (had an on-going ice storm outside) since freezing outside and no time to wait for nice days. Made a make-shift car fixture to hold the car in place while we rattle can painted them. This worked nicely since I could just spin the fixture on the black sack I placed on my freezer lid. Then on to wet sanding, stickers and clear coat. My son's blue car took 1st in Tiger scouts and then he took 1st in the pack against the winners from the Wolves, Bears, Webelos, and the Girl Scouts. His blue car also was the only scout car to get below 3.0000 seconds for the day. So he was Really excited! And because his car also had the fastest time of the day, (cub scouts vs girl scouts) the cub scouts got to keep the traveling trophy this year! It is too bad they didn't have a district race this year, but maybe next year. So here is my concern. I would really like to break the track record which the scoutmaster has said is over 200mph, but I can't see how that is possible with the bsa rules requiring stock tires? Is the more tricks I don't know of ? We worked really hard on the cars and I just can't figure out why they don't run close to 200mph like I see on many forums? We didn't touch the wheels (rules say can only sand casting marks), but we did polish the axels and setup for canted wheels and right on 5.0oz both cars. The blue car didn't rail ride (I forgot it needs to lean bottom in not out) but the black car does rail ride and its time was only in the 2.94xx range and it beat all the scoutmasters easily , but no where near 200mph?? Here is a picture from one of my son's races, but the mph is nowhere near 200mph??? 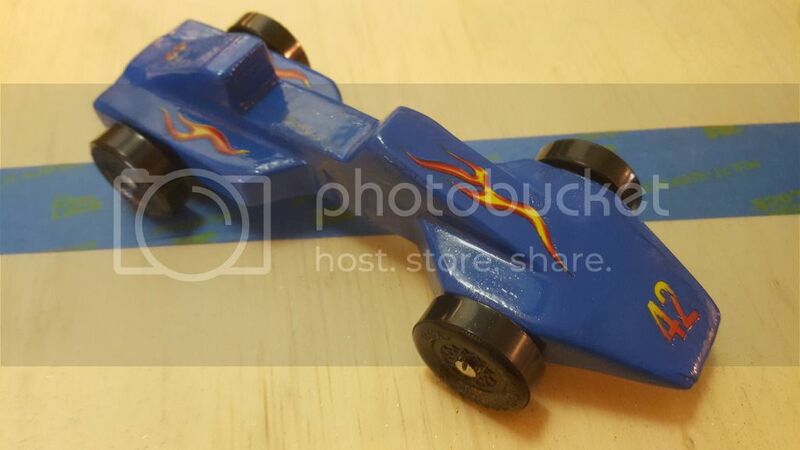 How fast can these BSA pinewood derby cars go with stock wheels and only axle mods? Could their scaling factor maybe be off in the software? DerbyDad325, Welcome to Derbytalk. Congratulations on all those Wins. I cannot get the pictures for whatever reason. Would you tell me what kind of track you raced on, the length, aluminum, wood, other ? How did they score - Elapsed time, points, etc ? Thank You. Hi Speedster, thanks for the welcome! The track was an aluminum 3 lane BestTrack with a "The Champ" timer and a manual operated lever for the spring loaded start gates. I'm not sure if it was a 42' or a 35' ? But it looks like after the ramp, there were i think 4 long straight sections. The timer and track end look like this. Every car would get a turn running each lane and then i believe they averaged the times to determine the winner. Can you post a link to your rules? If I can see the rules, I can give my recommendations for what I'd do if I were trying to squeeze more speed out of the car. For "What It's Worth Department". 42' Best track the cars travel 36'10" from start pin to timer. Mid America 2017 Race-Adult Graphite. 1st place 2.9393. 2nd place 2.9413. All cars recorded over 200 MPH until car #61 recorded 3.2198 at 199.58 MPH. These cars were probably all using 1 gram wheels, .092 stainless steel axles because of the lenient rules of the Mid America Race. Regardless of all the variables, your team has got a Fast car. DerbyDad325, your email address does not work for me. Thanks for the time details. I'm not 100% on the track length, just trying to guess by looking at videos of cars going down the track. I just can't wrap my head around a car that goes 200mph on that track when we are doing 160mph? Could the software maybe mistakenly think we are using a 35ft track instead of a 42ft? It is entirely possible that the race organizer put the wrong track length in there. Looking over your rules, one thing that's interesting is that it doesn't seem like aftermarket axles are banned. If this is the case, I would see if I could get some stainless steel axles from Derby Evolution or some other vendor. Too bad about that double elimination thing. What a horrible way to run a race! - Get the weight in the cars as far back as possible. Shoot for a balance point of 5/8" or less in front of the rear axle. - Configure the car as a front-wheel-raised rail-rider. (Be sure to verify your alignment). For a nice aluminum track, I'd say 4" of drift over 4 feet should be a safe bet. - Polish axles to 2000 - 3000 grit. Polish wheel bores with tamiya swab and Novus #2 polish. - Burnish the wheel bores with graphite several times each. Use a proven graphite like Hob-E-Lube or Maximum Velocity. Bill, I'm not sure why might posted pictures are not visible to you. Could be I posted them from dropbox so maybe others are having issues? Here is my son's car. Last edited by DerbyDad325 on Fri Mar 02, 2018 5:00 pm, edited 1 time in total. I was worried when pressing the nails in that the body would crack. I could feel the slot spreading apart when pressing in the front wheel nails. I got a picture of your son's car. Thank you. The Post you sent a few minutes later said "3rd Party Hosting has been temporarily disabled". It must be my end. I see VK was able to read your rules. If you counted 4 sections then it was a 42' Best track. I have a 35' Best track as does our Pack and District. The cars run 29'10". The best time at our District race is 2.4XX. More common time is 2.5XX. Strangely enough, Our Pack's 4 lane Best track has a Champ timer and the District's 4 lane Best track has a MicroWizard timer but the times recorded are very close. The District folks have quit this year and on March 10th the District will be using our Pack's track. The District actually uses 2 tracks. Our Pack track will race all the cars first. The 8 Fastest cars then move to a 4 lane, 40' Freedom track and race 8 more times. It's actually very exciting. The car that wins on the shorter Best track does not always win on the longer track - but he usually does. 3 - Get the weight in the cars as far back as possible. Shoot for a balance point of 5/8" or less in front of the rear axle. 4 - Configure the car as a front-wheel-raised rail-rider. (Be sure to verify your alignment). For a nice aluminum track, I'd say 4" of drift over 4 feet should be a safe bet. 5 - Polish axles to 2000 - 3000 grit. Polish wheel bores with tamiya swab and Novus #2 polish. 6 - Burnish the wheel bores with graphite several times each. Use a proven graphite like Hob-E-Lube or Maximum Velocity. I know they did the double elimination for the scoutmasters, but the kids got to run their car on each of the 3 lanes, and I think they averaged their times??? I just know the times and speeds they showed on the projector were the faster of the times I saw my sons car run, so not 100% sure. #1- Since it said cars must be made from BSA or commercial pinewood kits, I figured best to not buy aftermarket, but make the included parts work. #2- since I was worried about splitting the wood, I bought a few extra BSA kits from the hobby store and compared all the wheels and selected the best with the least wobble. #3- I had the tungsten weight as close to the front of the axle as I could and had holes behind the axle to add the final touches of weight to make 5.0oz on the dot. Of course I bought a derby car scale with 5.00 digit accuracy so I knew I'd be close going to weight in. Then a bit of tungsten putty to top it off and they had hot glue guns on site to hold it in place. On the black car, I used a domed tungsten weight with an axle slot built in. So the center of mass was closer to the axle on that car. It did fishtail more than the blue car until I made it rail ride. The blue car ran surprisingly straight. #4- both cars had a front wheel raised. But on the blue car is was running well with the wheel canted (top in so not rail riding) so I left it. The black car I didn't care if I messed up the alignment as much so after the practice I tried to set the front dominate wheel bottom canted in instead of out (rail ride) and it ended up on race day being much faster than the blue car. I checked the alignment of both cars on a straight section of plywood to get the drift a few inches on 3ft and then I epoxied the axles in place. #5- I bought a nail axle polishing kit at the hobby store and a nail bending block tool. Nails polished to 2000 grit and then front 1.5 deg back 2.5 deg. Did not know I could use a polishing compound as well. #6- I didn't touch the wheel bores even though I know they make pipe cleanser that you spin with polishing compound. I just only had 5 days from start to finish and wanted to make sure we finished the build. We did use graphite (the only thing allowed for wheels) I think it was Hob-E-Lube brand. So with stock wheels and those changes made I mentioned, do you think we actually could just be running 2.99 and 2.94 times on a 35ft track at 165mph and 167mph? Not having been around this ever. I wasn't sure what a car with these changes averages on a 35ft track versus a 42ft track?